The 15th century Palazzo Vitelleschi, on Piazza Cavour, houses the Museo Nazionale Tarquiniese and a significant collection of Etruscan treasures, including frescoes removed from the tombs. 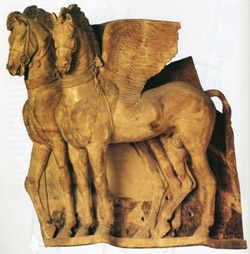 There is a beautiful terracotta frieze of winged horses, taken from the Ara della Regina temple. Numerous sarcophagi found in the tombs are also on display. The famous painted tombs are at the necropolis, a 15 to 20 minute walk away. Almost 6000 tombs have been excavated, of which 60 are painted, but only a handful are open to the public. Excavation of the tombs started in the 15th century and continues today. Unfortunately, exposure to air and human interference has led to serious deterioration in many tombs and they are now enclosed and maintained at constant temperatures. The painted tombs can be seen only through glass partitions. If You have a car, You can get to the remains of the Etruscan acropolis, on the crest of the Civita hill nearby. There is little evidence of the ancient city, apart from a few limestone blocks wich once formed part of the city walls, since the Etruscan generally used wood to build theur temples and houses. However, a large temple, the Ara della Regina, was discovered on the hill and has been exacavated this century.